White has just played the stone. In the game I answered a but that ended up giving white the jump at d in sente. As far as I know b is the other standard answer, and I thought that c may be a bit more active but I can't say whether it's a good idea or not. Timm: One of the things I've come up with is this, but I don't like it too much because White's really too happy after and , and the corner is still wide open. Slarty: This move is a good response. It seems to me this is playable and White ends up with less. Apart from that, the diagonal move to the center was slow, and you have moves like a,b, or c to make it shine. Usually in response to white's approach you would pincer, or perhaps a larger jump. That position turns up on several SL pages in a position search. 1. By “larger jump” you mean capping with a keima ? 3. I don't really understand why the kosumi is “slow”. Is it too solid (but Black still has problems), slack or...? 4. I like the idea of the shoulder hit. White's playing on the second line after all ! I'm nevertheless a bit concerned about leaving the big moves in the corner open. I guess to be consistent I shouldn't, since the high extension is influence oriented. But it's hard to use influence efficiently. Timm: edit: relevant related pages: Go strategy**, Vital point example, Keima side connection, BQM121, Intermediate distance and BQM335. 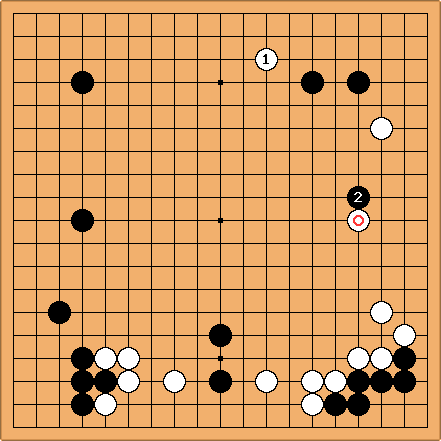 The example given in Go Strategy is surprisingly similar to my game. Sonoda recommends a 3 space low pincer (instead of the kosumi I played). tapir: You answered one question already. Distance of pincers is about the severity of the counterattack... I remember being intrigued by the advice in GoStrategy, but I do not see professional players actually playing like this, they play one or two-space pincers if they pincer. 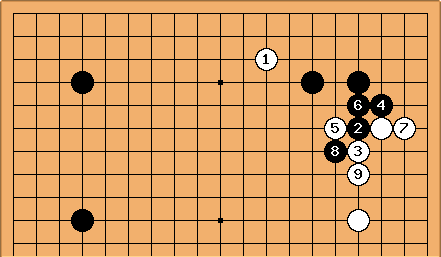 About the kosumi: I believe the kosumi is the stone that ends in the bad spot the way you play indicating something bad happened, but this does not mean the kosumi deserves all the blame it gets. In my opinion, the actual mistake is half-heartedly going for two different purposes at once. Shape response: I would hate to force with already in place, White will either get a good part of the corner or be able to cut off Black later - and solidifies the right side at the same time. tapir: Black omitted back in time, so in a way invited the approach by White. The time to wonder about your answer to the White approach is when you omit or even when you play . 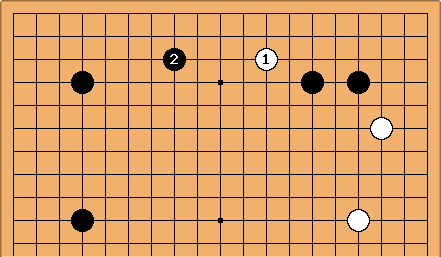 If you have no intention to play , may be better at a.
tapir: Black has the option to play a counterpincer instead of playing the kosumi semi-automatically (which I used to do as well). tapir: With White present around suddenly keeping White groups apart with seems more important. 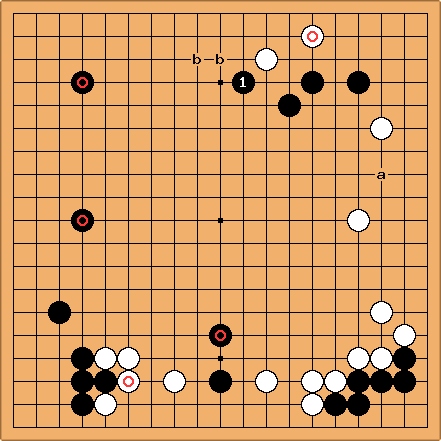 tapir: It seems to me most moves trying to save the corner only work in one direction, but there are white stones on both sides. would protect a foothold in the corner regardless. Of course other moves (such as a) might in fact be better. tapir: Another idea is leaning with . This can lead to many different variations, but the basic idea is simple. tapir: Now, likely this is not good to play in your case, but this would be a simple way to defend the corner (compare to slarty's diagram). In the game you tried both large scale splitting and defending the corner, which does not combine too well in my opinion. Timm: That's what I think. As you pointed out a better way (than what I did) to do that would have been to play the outside kosumi, then 3-3 but that does look slow. I don't think Black can look forward attacking on the right severely enough to make up for it. Slarty: The one-space jump is quite a strong shape although paradoxically it needs some defending. It would typically be better to pincer first and thus induce the defense to happen naturally in flow of play. Tapir showed that the diagonal move makes more sense when white has an extra stone. Oh, and you won't see pros play that way with a loose pincer because either is a mistake, or it's too severe to let happen. Depending on the continuation, you could try one of these jumps. c is the best followup before white has . I found a most reliable in handicap games. tapir: Not sure I am convinced w/ "either is a mistake or it's too severe to let happen". is pretty common after all, while the move proposed as answer in the book is not. However, the book example is a four-stone handicap game, so maybe what would be considered lukewarm in an even game makes for a good move there. I have several (handicap) games with this sequence. tapir: To back up my thought, here the kosumi in a professional game followed up in style on a large scale. 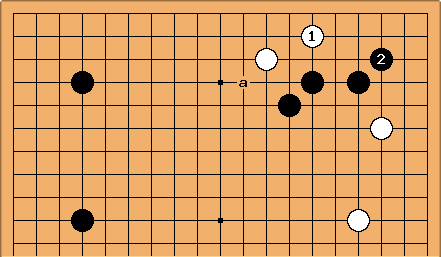 Here White looks at a and b, I reckon, and Black can't defend on both sides. Black defends the top and after White b crazy fighting ensues. Slarty: Ok :) As long as there is a good followup on the right is surely reasonable. kb: My first instinct. 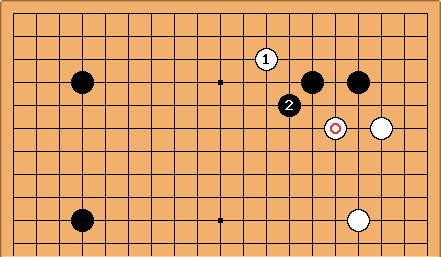 Coordinates well with Black's stones on the left (especially the stones), sets up an easy invasion at a, and supports an attack on the marked White stones. It does give up a lot of territory though. If you want more explanation, please ask questions, but this move feels right. My second instinct is to play at b, which has been already discussed above, but 1 might be better since Black has a good central strategy going. Defending the corner is bad and should only be used in an emergency. The 4-4 stone does not take territory. In addition, it is open on both sides. Timm: I'd still be worried about White's potential with , but Black's also gaining a lot in those exchanges. The topleft quadrant looks awesome. Is this too good for Black ? I guess should be at a instead — in that case, how should black answer ? Invade immediately on the right ? Dieter: To me the urgency lies at the bottom. 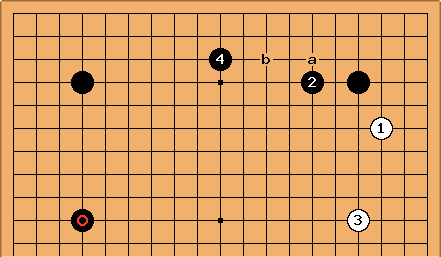 is a common technique to prevent White from crossing under, or to allow White doing so and build some thickness. It also cooperates with b. I'm in doubt though whether the direction is right. Perhaps White will accept c as a thank you move. Timm: Hi Dieter. This wasn't the subject of my question, but it is of course interesting. I'm curious about the underneath connection ; do you know if there's a page on this ? Then Black lives under. Is this the technique you're speaking of ? Dieter: yes. I thought there was a page on SL about this, but a position search doesn't deliver the page I thought existed. Anyhow, Black can live AND now effectively cuts. The presence of forces . unkx80: This position has some interesting inter-play with the corner. After , because White a is sente, White has an eye at the circled area. Furthermore, White can aim for a thousand year ko at the bottom right. How good is this position? Bill: To me, the real problem, as is so often the case, arises before the perceived problem. is a play that aims to follow up on the top side or the right side. It is joseki when there is no stone. With that stone in place Black has an invasion, not a pincer. Much better, as Sonoda says, to pincer on the top side right away. FredK Echoing Bill, I note that both Sonoda and Ishikura, in various books, characterize the immediate kosumi in a position like this as overly timid -- "weak spirit" is the literal Japanese expression. The point is that it puts no pressure on White, allowing W to settle with an immediate two-space extension to "a", and misses a chance to play a move near "a" combining a pincer with a double-wing extension from the northwest starpoint. If W responds with a jump into the center, then B can continue by leaning on W with an attach-and-extend combination starting at b, building secure thickness against which the pincered stone can be pushed once that phase of the operation resumes, with B getting moyo/territory in the northwest. Two points: First, W's position on the right --two three-space extensons-- is tight enough enough that B should not regret making it stronger, in fact overconcentrated; this will avoid enlarging W's position as in the outcome disliked by Timm in his second diagram, above. Second, the pincer attack will lead to profit on the left. Uberdude In a blitz game I'd play this one. Not saying it's a good move, but it's certainly fun and shows kiai. Don't let white boss you around: he wrecks your top side so you wreck his right. Note you have both ladders if he hanes under and cuts. The idea is if white wants to keep his right side territory then you can make your corner group stronger in sente and can then pincer and fight the top stone much harder. Or you might just gobble the approach stone to settle with some nice territory. 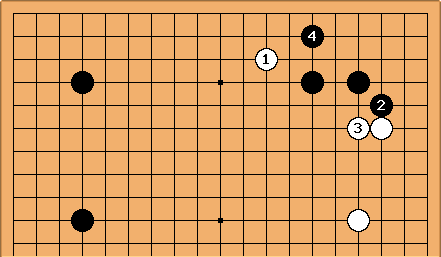 White can sacrifice that stone and jump into 3-3, but living at 3-3 means his top side stone loses options to make eyes. Or you can get crazy tenuki battles ;-).